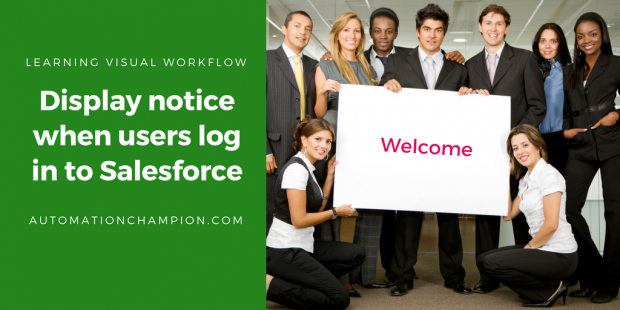 Many times I found that organization wants to display Notice/Information after user login into Salesforce, similar like Salesforce downtime or maintenance notification. Displaying information after login will help the organization to spread the words to several folks. Higher management in Universal Container wants to develop a feature when a user login into Salesforce they want to display important information to them. 8) Save the flow with name Login Flow then Activate it and close the canvas. 4) Once done click on the Save button. Note: – I will suggest you to Implement this first on your developer org test it and then move it to Production.